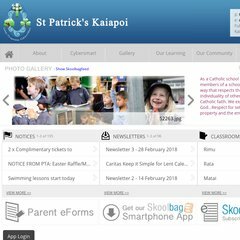 www.Stpatkai.school.nz - St Patrick's School Kaiapoi . The majority of visitors come from China, India, United Kingdom, Australia, Philippines & New Zealand. Topics: Enrolling At St Patrick's, and Inquiry Learner. 11,021 users visit the site each day, each viewing 4.34 pages. The programming language environment is ASP.NET. Its 2 nameservers are ns1.registerdirect.net.nz, and ns2.registerdirect.net.nz. It is hosted by Auckland Nz Auckland, using Microsoft-IIS/7 web server. The server is faster than 80% of measured websites, at 817 milliseconds.